Yesterday the Smart Display was listed as out of stock, today it isn't. The listing for the Smart Display was on Costco's site as early as yesterday, but you couldn't actually place any orders. 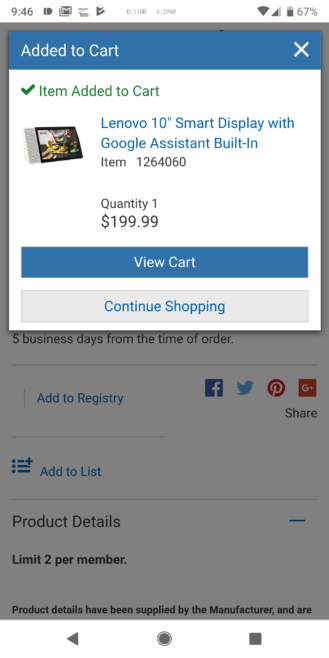 Attempting to do so would throw an error that the item is out of stock or unavailable. Given that Google's announcement said the technical launch was today, that's understandable, and today it isn't a problem. You'll need to be a Costco member to snag this deal, which itself costs a minimum of $60. Paired with the $50 savings, though, you could also look at it as paying $10 for your membership this year (assuming you don't buy anything else). Costco doesn't charge for shipping and handling, but there is tax, and you can pay an extra ~$10 for expedited shipping. Some Costco customers, including our own Artem, are still seeing the error that the item is out of stock or unavailable to order, though I was personally able to pick one up, no problem. YMMV in this case. It might be worth checking back in later to see if the error has resolved should you run into that particular snag. It isn't quite as good a deal, but Best Buy is also running a promotion that will snag you a $20 gift card with your $250 purchase of the 10" model, bringing the effective price down to $230. 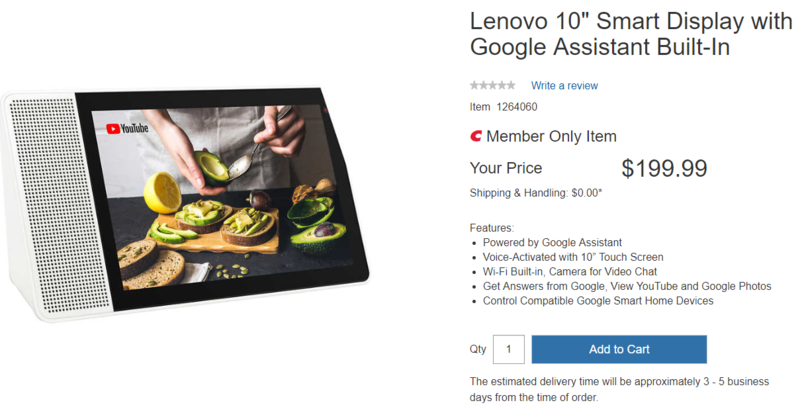 If you don't have a Costco membership (or if you're running into issues trying to buy one there), it's the best you can do for Lenovo's Smart Display. Although I was able to get an order in back on Friday, many of our readers were running into ongoing trouble trying to add the item to their cart at Costco's site. That particular problem appears to have resolved, and orders can now be placed again reliably—at least, for the time being. Still, I'd encourage anyone taking advantage of the deal to hurry, in case it breaks again.